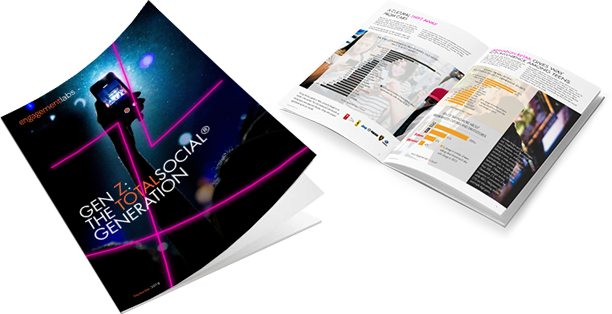 Download "GEN Z: THE TOTALSOCIAL® GENERATION" white paper. Learn social strategies that lead to opportunities on Gen Z as the next consumer powerhouse. Marketers have an inherent fascination with the next big thing, and the next big thing is Gen Z - the next consumer powerhouse is expected to account for 40 percent of all consumers by 2020. A new analysis of teenage conversation patterns by Engagement Labs shows that teens today—popularly known as Generation Z—present an entirely new challenge to marketers. Discover the brands and categories Gen Z talk about the most. Compare Gen Z to teenagers of the past and adults of the present. Gain critical, data-driven insights about how this group impacts consumer conversation. Make Generation Z your key to improved social influence success, both in social media and in real life.